Villa with spectacular views to sea and mountains. The ensuite bathroom from the master bedroom has a stand in shower, bidet, bath/shower head as well as toilet. From the loo you can see wonderful view of the hills behind Mijas. There is also a shaving point and plenty of cupboard space for your toiletries. The main bathroom shared by the twin rooms has a powerful shower with toilet and a shaving point. It is beautifully tiled with a view out to the hills and to the coast. The small hallway bathroom once again looks over the hills behind Mijas and has a sink and toilet. The Villa has been furnished to a high quality keeping the traditional elements of Spain with the modern feel needed in a rented property. The lounge has 2 large comfy slightly reclining leather sofas looking out to the beautiful view of the sea and rolling hills. There is Sky TV, WIFI, DVD player, stereo system with radio/CD player as well as numerous family and children's games. The kitchen is fully equipped with everything you would expect e.g. hob, microwave etc. From the dining room you can enter onto the lower terrace where the barbecue is set up for you to enjoy. From the lounge you can enter the main terraced area which also has a built in stone table for you to take breakfast and alfresco meals while still undercover from the heat of the day. For children (or the 'young at heart' adult) we have an X Box with a few select games should it get too hot outside. There is also a 2nd TV in the front twin room and another stereo in the 3rd bedroom at the rear of the Villa. Beautiful villa in a peaceful area. Only the occasional car goes by. Made use of the superb heated pool as there was a cold wind on some days. Bed very comfortable and allowed us a restful night's sleep. Need a car but 10 mins easy drive to lovely Mijas for plentiful restaurants (and 1 euro parking all day!) and 20 mins to Coin for a couple of supermarkets. Would definitely stay here again. Very clean villa and well kept grounds. This is a really lovely villa in a beautiful location overlooking the mountains. On a clear day it is possible to see the Riff mountains of Morrocco. The outside space is superb with attractive patio areas which were sheltered and warm while we were there in early February. It was great to sit outside late into the evening with the fire blazing and a bbq on the go. There are two bbqs and two outside dining areas! The pool area is spacious and there are plenty of sunbeds and seating areas. It is immaculate as is all the exterior space. The garden is very attractive and it was a real treat to be able to pick a lemon from the tree for the G&T! The gardener comes once a week to tidy the garden and clean the pool. The interior is comfortable and well appointed with everything one might need. A spacious living area with sofas , a wood burner, tv,wifi, library and lovely views leads to a smaller seating area and down steps to a large dining area. The kitchen is very well equipped and has two coffee machines, a fridge freezer, a very big drinks cabinet with masses of space for cold drinks,wine etc. We cooked a lot so were pleased to find most things were on hand even sharp knives; most unusual in a holiday let. The master bedroom is large and has great wardrobe space and a beautiful bathroom. The other bedrooms are smaller but are comfortable and well appointed. All rooms have ACs for hot or cold air which work efficiently. The cleaner keeps everywhere immaculate and provides clean bedding and towels once a week. She and the gardener speak no English but both cheerfully communicate in signs and gestures! The villa is in a lovely location but it is a quite a long way from any shops. A car is essential. There is a garage at Mijas for basics but a journey to a larger supermarket takes a while. We found it wasn’t really a problem because we shopped on the way back from trips and generally did a large shop to keep stocked up. Mijas is good for restaurants and there are some superb fish restaurants on the coast. Overall this is a lovely place to stay. We were there for three weeks and thoroughly enjoyed it. We are so pleased you all enjoyed your holiday and like the extras we put in to make it a comfortable and relaxing holiday. A big thank you to the owners for renting us out their villa. Thank you David for taking the time to write the review. We are pleased you and your son took advantage of the TV for the World Cup. We are a family who,love sport too....hence the Sky sports! We hope we can welcome you and your family back again in the future. We have a very good holiday.The house was very clean and there were much nice places to sit. Outside you can sit in the sun or the shadow. The swimming pool was very good and clean. We are pleased you enjoyed your holiday at Rosa De Piedras and look forward to welcoming you back soon . We loved the Villa, pool and the beautiful well kept gardens. Inside is just charming too! Thank you for taking the time to write a review. We are delighted you all enjoyed your holiday and look forward to welcoming you back again soon. Une villa exceptionnelle avec une vue et une piscine superbe ! Cette villa est vraiment très bien située dans un quartier très calme avec une très belle vue sur les montagnes et la mer. La maison est très bien pensée et de plein pied avec des sanitaires très modernes et très propres. Rien ne manque ni à l'intérieur, ni à l''extérieur. Les terrasses sont très nombreuses et on peut profiter du soleil toute la journée sur de nouveaux transats. La propriétaire est très sympathique et assure une préparation de vos vacances dans les moindres détails. Sur place, vous trouverez également quantités de notes et d'informations (sur les restaurants, les activités, les visites, ...) pour que vos vacances se déroulent merveilleusement. Néanmoins, il faut préciser qu'une voiture est indispensable pour tous les déplacements. Mais en 15 minutes, vous trouverez une petite station-essence pour tous les dépannages. Il faut compter 20-25 minutes pour les plus grosses courses et la plage. C'est vraiment un endroit à recommander et nous avons passé un merveilleux séjour. 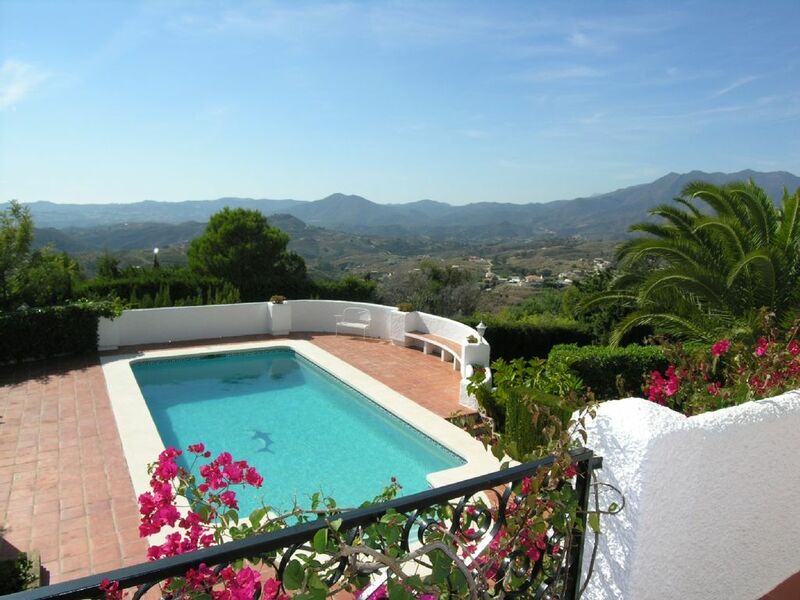 The Villa is located about 8 minutes from Mijas village in the peaceful location of Valtocado. The sea views from the Villa look out to coast and nearby hills and enjoy spectacular sunsets to the west in the evenings. Fuengirola is a 10 minute drive away with easy access to Alaurhin Golf course about a 5 minute drive.